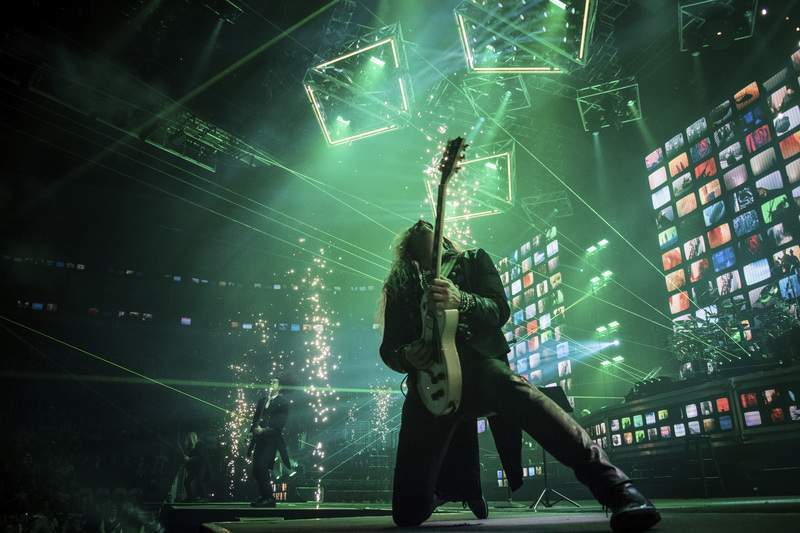 Courtesy Bob Carey Trans-Siberian Orchestra will perform at Memorial Coliseum on Thursday. SUNDAY – Brass Area Recital – 2:30 p.m.; Rhinehart Recital Hall, Purdue Fort Wayne, 2101 E. Coliseum Blvd. ; $7 adults, $6 seniors, $4 non-PFW students, free for PFW students; 481-6555 or www.pfw.edu/tickets. TODAY – MIMETime and Addison Stout – 7 p.m.; Cupbearer Cafe, 138 E. Seventh St., Auburn; no cover; 260-920-8734. TODAY – Amy Grant – 7:30 p.m.; Niswonger Performing Arts Center, 10700 Ohio 118, Van Wert, Ohio; 419-238-6722 or NPACVW.org. THURSDAY – Jeremy Camp and Matthew West – 7 p.m.; Memorial Coliseum, 4000 Parnell Ave.; 482-9502 or ticketmaster.com. SATURDAY – “Britten's War Requiem,” Fort Wayne Philharmonic – 7:30 p.m.; Embassy Theatre, 125 W. Jefferson Blvd. ; 260-481-0777, Philharmonic box office or FWPhil.org. THURSDAY – Piano Studio Recital – 7:30 p.m.; Rhinehart Recital Hall, Purdue Fort Wayne, 2101 E. Coliseum Blvd. ; $7 adults, $6 seniors, $4 non-PFW students, free for PFW students; 481-6555 or www.ipfw.edu/tickets. SATURDAY – John Curran and Renegade – 10 p.m.; Duff's Bar & Grill, 111 E. Chicago St., Columbia City; no cover; 260-244-6978. SATURDAY – The Hubie Ashcraft Band – 10 p.m.; The Venue, 110 W. Maumee St., Angola; $5; 260-665-3922. THURSDAY – “The Ghosts of Christmas Eve,” Trans-Siberian Orchestra – 7:30 p.m.; Memorial Coliseum, 4000 Parnell Ave.; tickets start at $39.50; 482-9502 or ticketmaster.com. SATURDAY – Little Big Band – 7 p.m.; Cupbearer Cafe, 138 E. Seventh St., Auburn; no cover; 260-920-8734. SUNDAY – Trine University Jazz Ensembles – 3 p.m.; Ryan Concert Hall, T. Furth Center for Performing Arts, 1 University Ave., Angola; free. THURSDAY – Todd Harrold Duo – 6 p.m.; Rack and Helen's Bar and Grill, 525 Broadway St., New Haven; 749-5396. THURSDAY – Dweezil Zappa – 8 p.m.; Clyde Theatre, 1808 Bluffton Road; ClydeTheatre.com. TODAY – “Karaoke Classics Live,” Heartland Sings – 7:30 p.m.; C2G Music Hall, 323 W. Baker St.; $20 advance; $25 at the door; HeartlandSings.org. TODAY – Motor Folkers – 6:30 p.m.; The Venice, 2242 Goshen Road; 482-1618. TODAY – Albert's Landing – 8 p.m.; Deer Park Irish Pub, 1530 Leesburg Road; no cover; 432-8966. SATURDAY – Brothers Osborne – 7:30 p.m.; Clyde Theatre, 1808 Bluffton Road; $27.50 advance, $32.50 day of show; Clyde box office, 800-514-3849 and ClydeTheatre.com. SATURDAY – Chris Worth & Co. – 9 p.m.; Four D's, 1820 W. Dupont Road; no cover; 490-6488. SATURDAY – Pink Droyd – 8 p.m.; C2G Music Hall, 323 W. Baker St.; $15 to $30; 426-6434 or www.c2gmusichall.com. SATURDAY – Holbrook Brothers Band – 9 p.m.; Hamilton House, 3950 E. Bellefontaine Road, Hamilton; no cover; 260-488-3344. SATURDAY – Joe Justice – 8 p.m.; HT2, 10212 Chestnut Plaza Drive; no cover; 616-0444. SUNDAY – The American Legion Band and the New Horizons Band – 2 p.m.; The History Center, 302 E. Berry St.
SUNDAY – The Wonder Years, Have Mercy, Oso Oso, Shortly – 7 p.m.; Piere's Entertainment Center, 5629 St. Joe Road; $22.50. MONDAY – Five Sax – 7:30 p.m.; Cole Auditorium, 901 Garden St., Kendallville; $20 at the door, free for children high school age and younger. TUESDAY – Summit City Singers – 7 p.m.; Kingston on Winchester, 7515 Winchester Road; free, donations welcome. TUESDAY – Joe Justice – 10:30 a.m.; Lincolnshire Place, 11911 Diebold Road; no cover; 471-1620. TUESDAY – Chris Worth – 6:30 p.m.; American Legion Post 148, 705 E Lewis St.; no cover; 423-4751. TUESDAY – Five Sax – 7:30 p.m.; Bryan Arts and Education Auditorium, 120 Beech St., Bryan, Ohio; $30 adults, $5 students at the door; WCCCA-LOS.org. WEDNESDAY – Guitar Ensemble Concert – 7:30 p.m.; Rhinehart Recital Hall, Purdue Fort Wayne, 2101 E. Coliseum Blvd. ; $7 adults, $6 seniors, $4 non-PFW students, free for PFW students; 481-6555 or www.ipfw.edu/tickets. THURSDAY – The Accidentals – 8 p.m.; C2G Music Hall, 323 W. Baker St.; 426-6434 or www.c2gmusichall.com. Ricky Skaggs and Kentucky Thunder: 8 p.m. Dec. 8; Clyde Theatre. Rescheduled due to illness. Tickets for tonight's show will be honored on the new date and tickets are on sale for the Dec. 8 show at ClydeTheatre.com. Refunds available; credit card purchasers should contact ETix at 800-514-3849, cash purchasers should go to the Clyde Theatre box office at 1808 Bluffton Road. Jefferson Starship: 7:30 p.m. Feb. 2; Niswonger Performing Arts Center, 10700 Ohio 118, Van Wert, Ohio; 419-238-6722 or NPACVW.org. Neil deGrasse Tyson: 7:30 p.m. May 21; Embassy Theatre, 125 W. Jefferson Blvd. ; tickets start at $49; 800-745-3000 or www.ticketmaster.com. Tickets go on sale at 10 a.m. Nov. 16. Tower of Power: 8 p.m. Nov. 16; Clyde Theatre, 1808 Bluffton Road; tickets start at $39; Clyde box office, 800-514-3849 and ClydeTheatre.com. Here Come the Mummies: 7:30 p.m. Nov. 30; Clyde Theatre, 1808 Bluffton Road; $22.50 advance, $25 day of show; Clyde box office, 800-514-3849 and ClydeTheatre.com. “Mannheim Steamroller Christmas”: 7:30 p.m. Dec. 1; Embassy Theatre, 125 W. Jefferson Blvd. ; tickets start at $29; 800-745-3000 or www.ticketmaster.com. Hairball: 8 p.m. Dec. 14; Clyde Theatre, 1808 Bluffton Road; $17.50 advance, $22.50 day of show; Clyde box office, 800-514-3849 and ClydeTheatre.com. “Harry Potter and the Chamber of Secrets” with Fort Wayne Philharmonic: 7:30 p.m. April 10 and 11; Embassy Theatre, 125 W. Jefferson Blvd. ; 1-800-745-3000 or www.ticketmaster.com.